The Brookings Institution, a private, nonprofit organization devoted to public policy analysis based in Washington, D.C., played an instrumental role in helping North Carolina cope with the effects of the Great Depression. In the process, the organization helped the state dramatically reshape its system of government. At the time North Carolina, like the rest of the country, was struggling to cope with economic hard times. Shrinking revenues and a desperate need for tax relief put great pressure on Governor O. Max Gardner to devise a plan that would enable the state to efficiently provide necessary public services while at the same time relieving the tax burden of North Carolina's citizens. Searching for solutions, Governor Gardner turned to the Brookings Institution for help, requesting that the institution undertake a study of North Carolina state and county government and make recommendations for implementing such a plan. 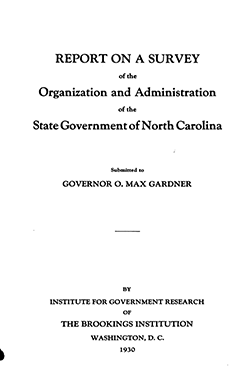 After careful study and analysis, the Brookings research staff created their report and presented it to Governor Gardner in December 1930. In it they described a scheme of government within which all agencies would function as parts of a whole, complementing rather than contradicting or duplicating each other's efforts. The report also suggested ways of shifting financial responsibility for some public services from the counties to the state in order to help reduce local property taxes. At first many North Carolinians were shocked at what they felt was the radical nature of some of the institute's recommendations. Among the controversial proposals was one for a "short ballot," so called because it would have reduced the number of elective administrative offices in state government from 13 to 3. Also of concern were recommendations for the merging of several counties and the transfer of many responsibilities and prerogatives from the counties to the state. Despite such concerns, the desperate needs of the times demanded change. When the governor presented his program to the 1931 legislature, it included a number of the Brookings report proposals. Nearly all of these were enacted into law. Among the most significant of the proposals adopted in that legislative session was a plan for consolidation of the University of North Carolina in Chapel Hill, North Carolina State College in Raleigh, and the North Carolina College for Women in Greensboro. Lawmakers consented to the creation of a State Division of Purchasing and Contract and the creation of a State Department of Personnel. The legislature also agreed that the state would assume much of the responsibility for roads and prisons and the financing of local schools. The adoption of the Brookings Institution recommendations in 1931 marked the beginning of a dramatic shift of power in North Carolina. As subsequent legislatures enacted further changes based on the report, more responsibilities and authority would shift from the county seats to the state capital of Raleigh. Surprisingly, many of these initiatives were met with relatively little protest. This was because the state was able to provide many services better than the local authorities had been able to do, and the government in Raleigh also took over much of the financial responsibility for these services. Paul V. Betters, ed., State Centralization in North Carolina (1932). 1 January 2006 | Weaver, Robert D.